A Cricket in the Court of Akbar features in-depth interviews with a number of prominent musicians and experts from India and the United States, each contributing insight into Indian classical music and the cultural context within which it exists today. The film also includes music from legendary sitarist Pandit Nikhil Banerjee, as well as previously unreleased recordings of Pandit Krishna Mohan Bhatt, Pandit Vishwa Mohan Bhatt, Pandit Manilal Nag, Steve Gorn, Pandit Samir Chatterjee and many others. He has performed in major festivals on three continents. In India, his concerts include appearances in the prestigious Saptak Music Festival in Ahmedabad, Haridas Sangeet Sammelan in Bombay and the Desert Festival in Jaiselmer. His performances in Europe include concerts in Berlin, London, Paris, Brussels, Luxembourg, and appearances at the Venice Bienale, Lugano Music Festival, Zurich’s Reitberg Museum, Guitarra International in Cordoba, Spain and I Suoni Del Tempo in Cesena, Italy. He recently had the honor of being the first Indian musician invited to participate in the avant-garde Music of Extended Duration Festival in Prague Castle in the Czech Republic. In America, his performances include concerts at the Herbst Theater and the Great American Music Hall, San Francisco; Carnegie Hall, Symphony Space and the Cathedral of Saint John the Divine in New York. A prolific composer and cultural ambassador who bridges the gap between East and West, Krishna has collaborated with Western and Indian musicians since the early 1980s. He has recorded with Ali Akbar Khan, Zakir Hussain, the Kronos String Quartet, and Rajasthani folk musicians among others. His performances are broadcast regularly on Indian radio and television and he is the recipient of several awards and titles including the Sur-Mani (Gem of Melody), AIIS Senior Fellowship Award, and honors by the Rajasthan Sangeet Natak Academy. His collaborative work with saxophonist George Brooks and Zakir Hussain, “Lasting Impression”, a CD of Indo-Jazz fusion, was nominated for a Grammy. In recognition of his pioneering research into the folk origins of North Indian classical music, the Rajasthan Tourism Ministry sponsored several gala concerts featuring Krishna Bhatt with Manganiyar folk musicians in Rajasthan and Gujarat. In addition, Krishna has discovered previously unrecognized Rajasthani ragas and established their structures. 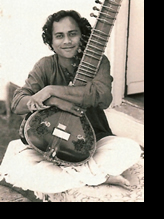 For more information on Pandit Krishna Mohan Bhatt, visit http://krishnabhatt.com. Samir Chatterjee is a virtuoso Tabla player of India. He travels widely across the world throughout the year performing in numerous festivals as a soloist or with other outstanding musicians from both Indian and western traditions. His compositions are widely acclaimed as well as his writings. Chatterjee began his studies early with Pt. Bankim Ghosh, Pt. Balaram Mukherjee, Pt. Rathin Dhar and Md. Salim, tabla maestros in India. His later formation as a musician occurred under the guidance of Pt. Amalesh Chatterjee (since 1966) and Pt. Shyamal Bose (since 1984). All of Samir’s teachers have been from the Farrukhabad Gharana (school) of Tabla playing, which he now represents. The national radio of India maintains Samir Chatterjee as an A-rated artist. He can be heard on numerous recordings featuring as soloist, accompanying many of India’s greatest musicians and in collaboration with western musicians of outstanding caliber. In concert Chatterjee has accompanied many of India’s greatest musicians including Pt. Ravi Shankar, Ud. Vilayat Khan, Pt. Nikhil Banerjee, Pt. Jasraj and Ud. Amjad Ali Khan, to name only a few. Samir Chatterjee lives in New Jersey and has become a catalyst in the fusion of Indian and Western music in the New York City metro area, performing with Pauline Oliveros, Ravi Coltrane, Dave Douglas, Myra Melford, Steve Gorn, William Parker, Dance Theater of Harlem, Da Capo Chamber Orchestra, Boston Musica Viva and other jazz and avant garde groups. He is a member of jazz trio SYNC with Ned Rothenberg and Jerome Harris. 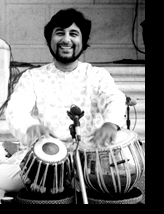 He is the composer and director of Nacho Nacho - Gypsy Storyteller and Chhand-Anand, World percussion Ensemble. He performs with Sanjay Mishra on his CD Blue Incantation featuring Jerry Garcia as guest artist. He is the Founder-Director of CHHANDAYAN, not-for-profit organization dedicated to promoting and preserving Indian music and culture. Samir Chatterjee has also had a career as a musicologist and journalist. He has two masters degrees to his credit, in English and History. 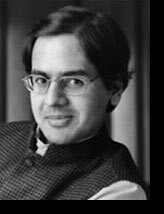 Samir Chatterjee is currently on the faculty of Manhattan School of Music and Chhandayan. For more information, please visit the Chhandayan website at http://tabla.org. 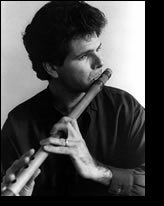 Steve Gorn, whose flute is featured on the 2004 Academy Award winning Documentary film, Born into Brothels, has performed Indian Classical Music and new American Music on the bansuri bamboo flute, soprano saxophone and clarinet in concerts and festivals throughout the world. 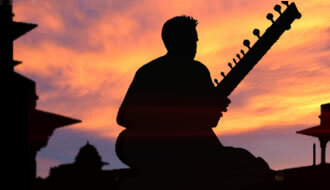 Well known to audiences in India and the west, he has been praised by critics and leading Indian musicians as one of the few westerners recognized to have captured the subtlety and beauty of Indian music. As an innovator in the field of contemporary world music, he is featured on Paul Simon's CD, You're The One, and has toured and recorded with Jack DeJohnette, Coleman Barks, Glen Velez, Krishna Das, Alessandra Belloni, and Layne Redmond. He has composed the score for the play, "The Tibetan Book of the Dead," Ranjabati Sircar's dance, "Cassandra," and numerous other spoken work dramas. His most recent recordings are Colors of the Mind, and Priyageeta, and are available at www.SteveGorn.com. There was always music in Suphala’s life; she began studying classical piano at age four. But then she found her calling in the tabla, which won her over with its beautiful sound and the freedom of its improvisatory nature. Suphala is a protégé of the great tabla masters Ustad Allarakha and Ustad Zakir Hussain, who are a constant source of inspiration to her. In Feb. 2005, Suphala made history when she became the first musician to play in public since the fall of the Taliban. According to the New York Times, "Kabul's badly depleted music scene received a welcome injection of excitement last week with the arrival of Suphala, the New York-based tabla player and composer… Suphala certainly brought brightness… her touch and rhythm are sure." It caused a sensation in the war-torn country. "I have not played with a woman before," one Afghan tabla master said. "Our grandfathers do not even know of it." Blueprint (Suphala Productions, released 2007), now available worldwide (2008), is Suphala's stunning new album. She builds from the base of her world- renowned tabla knowledge, with infusions of modern electronic sounds, and top-flight songwriting. Suphala features such notables as vocalist Edie Brickell (on two songs), heavyweight producer King Britt, guitar legend Vernon Reid, as well as bansuri player Rakesh Chaurasia, Vikter Duplaix, Harper Simon, Mazz Swift, David Gotay and others on her third and most adventurous release. Her previous album, The Now, (Rasa/ Tommy Boy Records, released 2005) featured contributions from such stellar guests as Norah Jones, Vernon Reid, and even Antonio Banderas, and was featured from the New York Times to the Times of India. While her first album, Instru Mental, (Suphala Productions, released 2000) offers music for those who love beats mutated and transformed into futuristic combinations. Adding production chops to her many talents, Suphala produces primarily in her home based studio with her tabla, a computer, a keyboard, and microphone. 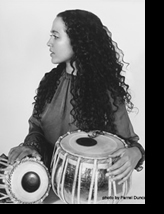 Yet from this barebones beginning, she fleshes the songs out with rich melodies, harmonies, and a virtuosic display of tabla playing and programmed beats. Suphala has also been sought after for performance and recording by a wide range of talented artists including Sean Lennon, Perry Ferrell (Jane’s Addiction), hip- hop producer Timbaland, Lady Ms. Kier (Dee-Lite), 4Hero, Yoko Ono, Vijay Iyer, DJ Logic, Gingger Shankar, Michael Bland (Prince), and Jeff Lee Johnson. Professor Dehejia received a B.A. with highest honors from Carleton University (Ontario, Canada) in 1992 and a Ph.D. in Economics from Harvard in 1997. Before joining Tufts he served as Associate Professor at the Department of Economics and at the School of International and Public Affairs (SIPA) of Columbia University. He is a Faculty Research Fellow at the National Bureau of Economic Research (NBER), and held visiting professorships at Harvard, New York University, and Princeton. Professor Dehejia has produced contributions to several areas of economic research, including applied econometrics, labor economics, development economics, and the economic analysis of microfinance. His widely-cited work has been published in top academic journals, such as the Journal of the American Statistical Association, the Review of Economics and Statistics, the Quarterly Journal of Economics, the Journal of Econometrics, the Journal of Public Economics, the Journal of Development Economics, and others. He has developed new methods for program evaluation, and provided important insights on the evaluation of job training and work-to-welfare programs, right-to-work laws, child health and child labor issues, financial development and growth, microcredit and saving, the welfare effects of religious organizations, and other topics of major relevance from a public policy and social perspective.